Top row, second from the left to second from right: Rose “Mother” Shakespeare, Sir Walter Raleigh, William Shakespeare, and Anne Hathaway. Front row center: Queen Elizabeth flanked by two Spanish spies (for a cast list see Midsummer Night’s Screame cast.pdf). 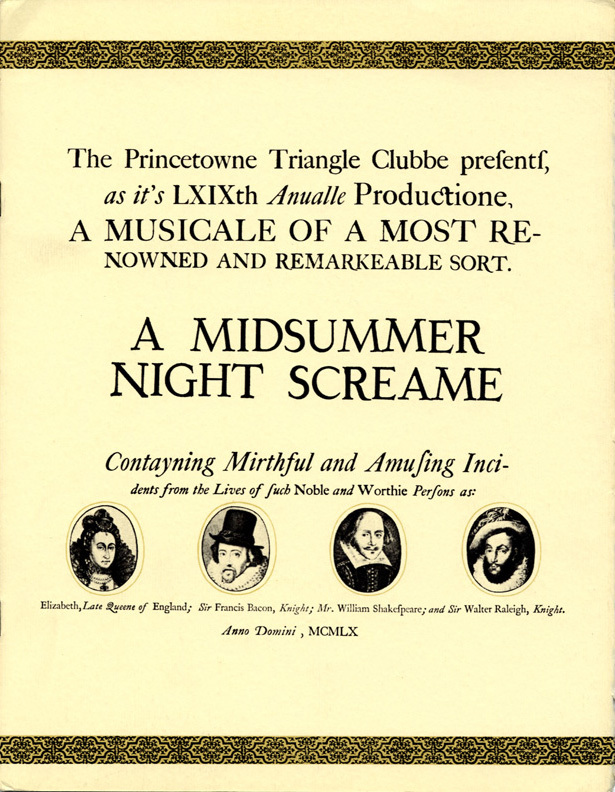 In Triangle’s pseudo Shakespearean musical, A Midsummer Night’s Screame (1960-1961) Queen Elizabeth I (Geoffrey Smith ’61) is a playwright, who enlists the help of Sir Walter Raleigh (John Crowther ’61), to find a suitable man to take credit as the author of her works. 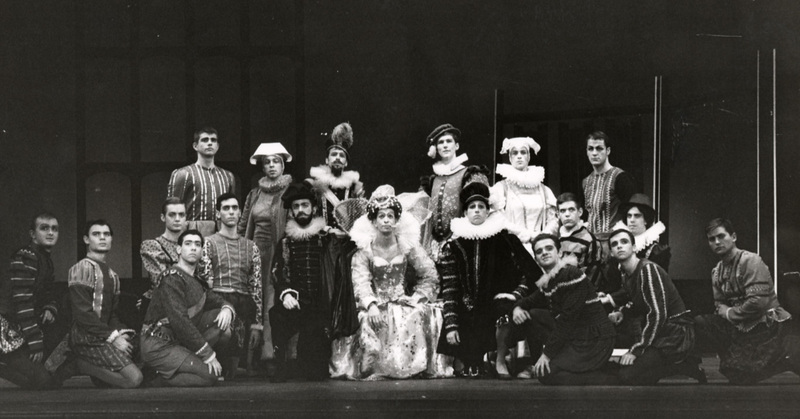 He discovers William Shakespeare (Alexander Kennedy ’62), an aspiring, but not particularly talented poet. Two Spanish spies at the English court (John Simon ‘63 and Hugh Bartlett ’62) discover the Queen’s secret and encourage her to continue her writing, so that she may be distracted from her queenly duties, allowing the Spanish Armada to attack England. How the story unfolds is not clear, as the Triangle records contain only part of the script. The film featured here, however, shows how the story ends. According to reviews of the play this “Pathos newsreel” (a play on the Pathé newsreels discussed in a previous blog entry) was shown during the third act as a conclusion to the play. The silent movie, which parodies the newsreels of the early-twentieth century (“Ye Eyes & Ye Ears of The World”), is full of deliberate anachronisms and visual gags, interspersed with clips from other movies and newsreels. It opens with an actor in Shakespearean garb pretending to operate a film camera. In the first scene, Rose “Mother” Shakespeare (Bert Wunderlich ’62) is in scuba gear preparing to cross the English Channel. 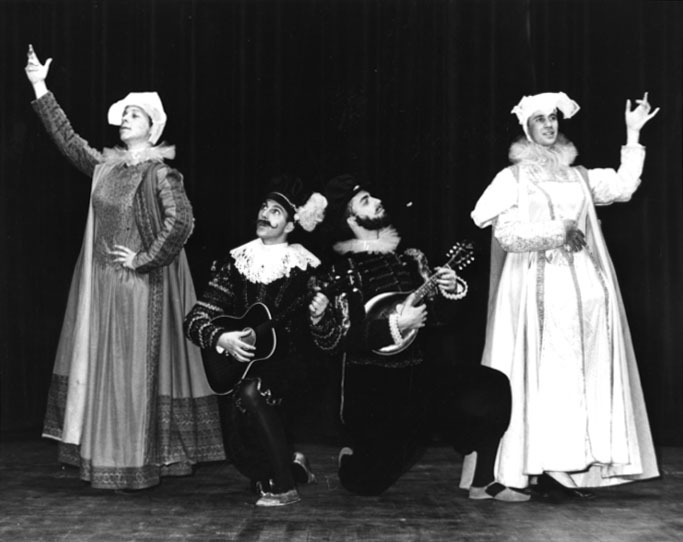 Accompanying her in a rowboat are Shakespeare’s wife, Anne Hathaway (Roy Young ’62), and the two young Shakespeare children, Susannah and Hamnet. The scene was shot to look as if it was a modern day sporting event. Rose is interviewed by reporters, as she plugs her sponsor, The Boar’s Head Tavern. This scene is a reference to the sport of English Channel swimming, which goes back to the 19th century; in 1926 the first woman crossed the channel, accompanied by family and friends in a boat. At the halfway point in the film (4:00), Shakespeare and Raleigh cross paths with Rose and the boat containing Anne and the children. The boat seems to be sinking (Raleigh is scooping water from his boat with a hat) and at 4:22 the men appear on Hathaway’s boat, having somehow escaped their sinking vessel. At 4:42, Shakespeare and Raleigh board one of the Spanish ships, which turns the battle in England’s favor: Cannon balls fly back into their cannons, plumes of smoke dissolve, and damage is undone. However, the battle is not over quite yet. Aboard the Spanish ship, Raleigh and Shakespeare must grapple with the two Spanish spies. They finally outsmart and overpower the Spaniards, forcing one of the spies to wave a white handkerchief. Shakespeare, Raleigh, and a Native American representative shake hands and congratulate each other for a job well done. The film concludes with “London: V-S Day,” presumably standing for “Victory Over Spain Day” (7:11). What happens to Rose Shakespeare (singing with the two Spanish spies and Anne Hathaway to the left) we do not know. If there is any alumnus who participated in the play and still possesses the complete script, we would love to have a copy! Reviews of the play were mostly positive. 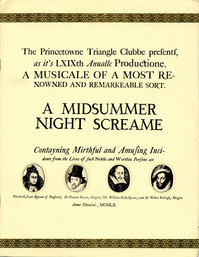 The musical and dance numbers received the most acclaim, especially a twenty-minute musical version of Macbeth. A dance critic from the New York Herald Tribune called the dance numbers “brilliant.” Chairman of the Board, Marshall M. H. Dana ’32, seemed to think that a few of the songs from the play were potential musical hits. He thought so highly of them that he wrote to Triangle Club alumnus and screen star, Jose Ferrer ’33, requesting that he play the songs for his wife, singer Rosemary Clooney, with the hope that she might record them. — Alina Serafini, Rutgers University Class of 2011 and Mudd Library intern, Fall 2010. This silent 16mm films is part of the Triangle Club Records (AC122) (Box 177). Mudd Library is thankful for the support that the Triangle Alumni Board provided for digitizing these films and unlocking their contents. This entry was posted in Arts by Helene van Rossum. Bookmark the permalink.